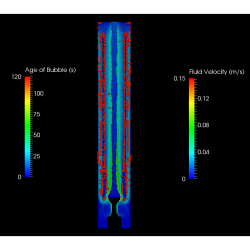 Menatech Limited has carried out an advanced computational fluid dynamics simulation of an air lift reactor in collaboration with the University of Chester, Chemical Engineering Department at Thornton Science Park. The simulation incorporates a transient Lagrangian-Euler coupled multiphase flow including particle forces such as drag and gravity. Air injection was achieved with micron sized air bubbles. Air lift reactors promote extremely gentle mixing with significantly reduced shear. This is a highly beneficial advantage when attempting to mix very delicate fluids and is a typical real-life chemical engineering problem. With technical guidance provided by Professor Steve Wilkinson, Head of Chemical Engineering, the results of the simulation were found to compare well with those observed under experimental conditions, a subject of current research by the department.